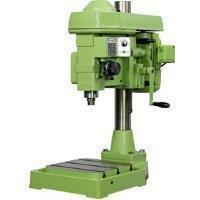 The tapping machine provided by CHEN FWA is quality made for customers worldwide. The product ﻿features one circuit feed and one pitch, so each of them will not rotate even without adding pressure or clamping device while working. Besides, the spindle pulley of the tapping machine will stop when tap meets resistance or when the machine is overloaded. This is a mode for your safety, and it is controlled by a clutch which can reduce the force from cutting and torque of tap and protect tap from being damaged. Another feature the tapping machine provides is that the equipment is easy to operate for not only skilled workers but also new users. The merit is quite helpful to increase efficiency and quality workmanship, not to mention saving costs for your business. Moreover, the tapping equipment we offer are automatic, so the machine can be mounted with multiple spindle heads. If you are interested in our equipment, please do not hesitate and contact us today for more information! We are happy to provide you the best and help you to run your business without any extra expenditure! One circle feed, one pitch, working piece will not rotate even without added pressure or clamping device. Both unfamiliar and skilled workers can operate this machine well, which is helpful to increase efficiency and quality workmanship. Spindle pulley will slip and spindle will stop when tap meets resistance or machine reaches overload. This situation is controlled by a safety clutch, which can reduce the force from cutting and torque of tap and protect tap from being damaged. All automatic tapping equipment can be mounted with multiple spindle heads that can increase productivity and produce unique whole-screw threading. Upward multi-spindle machine increase production rate with robot combination.